High Frequency - Only for Specialists? Users of high frequency components are often confronted with problems including unwanted oscillation, poor ground shielding, nonlinearities, gain peaking and bandwidth reduction caused by poorly designed amplifiers. FEMTO High Frequency Amplifiers have been designed to eliminate such unwanted problems. Insensitive to signal source parameters and input wiring, FEMTO High Frequency Amplifiers perform meticulously within their specifications. No gain peaking, oscillation or significant bandwidth reduction will occur, even for source capacitances up to maximum 2 nF. Bandwidth Independent of Source Capacitance Merely a few picofarads of source capacitance can drastically decrease the bandwidth of high frequency current amplifiers. However, FEMTO Current Amplifiers do not have this limitation and are not influenced by a wide range of source capacitance. No frequency compensation or special adaptation is needed and the bandwidth and gain are constant up to the maximum source capacitance specified for each model. "C"-Models Amplifier models shown with an additional "C" are optimized for handling very large source capacitances up to nanofarads. They are very useful for measuring fast signals down to nanoseconds with large area detectors. For detectors with even more than 2 nF capacitance we offer custom designed models. Please contact us for details. 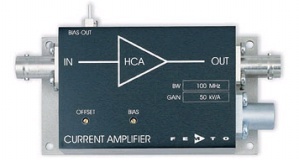 Adjustable Offset and Bias Voltage For a high degree of flexibility FEMTO`s HCA Current Amplifiers offer precise offset and bias control by two trimpots. The wide range of the adjustable input offset current compensation preserves full dynamics even for signals with large DC-components. The Voltage at the bias-output can be adjusted precisely from -12 to +12 Volts using the multi turn bias-trimpot.